Is John le Carré one of the greatest English novelists of the post-war era or a writer of overblown commercial thrillers? Adam Sisman’s brilliant and exhaustive biography describes the reception of each of the novels, offering the contradictory judgements of writers from Anthony Burgess to Philip Roth, but he himself does not come down on one side or the other. I have to declare an interest here: I love most of the novels, particularly the George Smiley sequence, and can re-read them with huge pleasure. Le Carré’s great subject is betrayal, and Adam Sisman reveals the roots of this obsession. 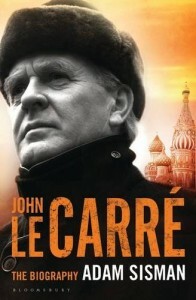 Le Carré – or David Cornwell as he is in real life – has been both victim of treachery and a betrayer in his turn. His father, Ronnie, was a conman, whose crowd of victims includes some astonishing names. He forced David and his elder brother to run errands for him, involving them in his crimes. On one occasion he sent them to Paris to collect money for illegal shipments of unbranded whisky from the Panamanian ambassador. He also wanted them to collect the golf clubs he’d left at the George V Hotel. In fact, he had already taken money for the whisky and never delivered it, and he had been unable to pay the hotel bill and had therefore been forced to leave the clubs as security. The two boys, without money, had to sleep with the tramps under one of the Seine bridges until they could get home. Their mother had run away from an intolerable life, without taking any measures to protect her young sons. David was brutally beaten at boarding school and, possibly, abused. He left early and bravely took himself to Switzerland to take a course at Bern University. Here he had his first encounter with British intelligence and ran some spying errands. Returning to England, he went up to Oxford, spied on his friends, left early to marry and take a teaching job, went back to Oxford and took his degree. He taught at Eton, worked for MI5 and MI6, and went on to become the bestselling author of The Spy Who Came in From the Cold, which allowed him to leave his job to write full time. The man who emerges from Adam Sisman’s research and analysis would be a wonderful dinner companion – clever, funny, always entertaining – but on the basis of the 600 pages of this wonderful biography you would have to be very brave to want to get much closer to him.